Events and actions have already begun around the world for the Days of Action to Free Georges Ibrahim Abdallah from 14 to 24 October, the international week of action marking the 34th anniversary of the Lebanese Communist struggler for Palestine‘s arrest by the French state – and the beginning of his 34th year in French prison, despite his eligibility for release since 1999. The week of action kicked off with an exciting action organized by the Greek Front of Resistance and Solidarity for Palestine “Ghassan Kanafani”,who raised a banner to free Georges Abdallah on Saturday, 14 October at the football game between Atromitos and Asteras Tripolis at a central spot beside the Atromitos fans. Other early events were held in Bordeaux, from which participants will also join the large national march in Lannemezan on Saturday, 21 October. On Friday, 13 October, the Collectif Liberons Georges 33 organized an evening of solidarity with Georges Abdallah featuring a screening of “3000 Nights” about Palestinian political prisoners; the following night, the organizers held a dinner with Jacques-Marie Bourguet to support Georges Abdallah. 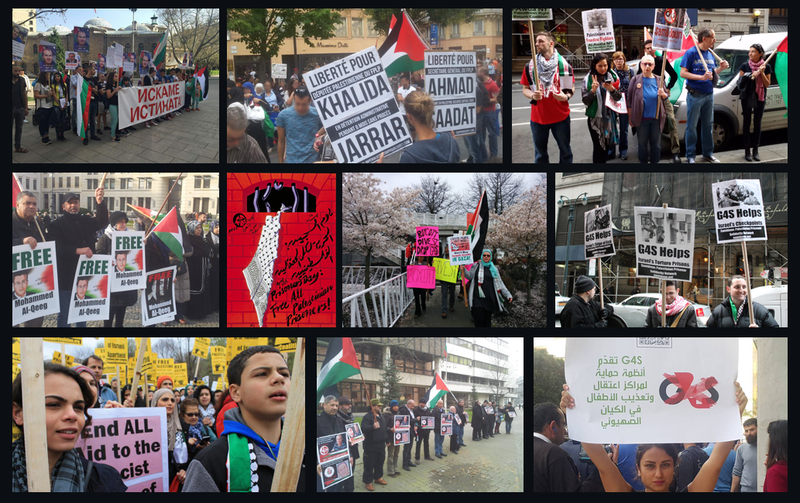 Meanwhile, in New York City, Samidoun in New York organized the first of two protests it will hold to demand freedom for Georges Abdallah and that the French state act to free detained Palestinian lawyer Salah Hamouri from Israeli jails. Protesters gathered at the French mission to the United Nations, carrying placards and distributing information about the cases. In Belgium, the new appeal for freedom for Georges Abdallah has attracted over 100 signatures, including 20 organizations such as Intal, Palestina Solidariteit, Activist Child-Care, Mouvement Citoyen Palestine, Plate-forme Charleroi-Palestine and the BDS Committee at ULB. Palestinians in Gaza issued solidarity videos expressing their support for the international campaign to free Georges Abdallah. Many more events are being organized and will take place in Manchester, Brussels, Berlin, Den Haag, Toulouse, Marseille, Villeneuve, Lannemezan, Paris, Bordeaux, New York City, Tunis, Beirut and elsewhere. There is still time to join in the week of action! 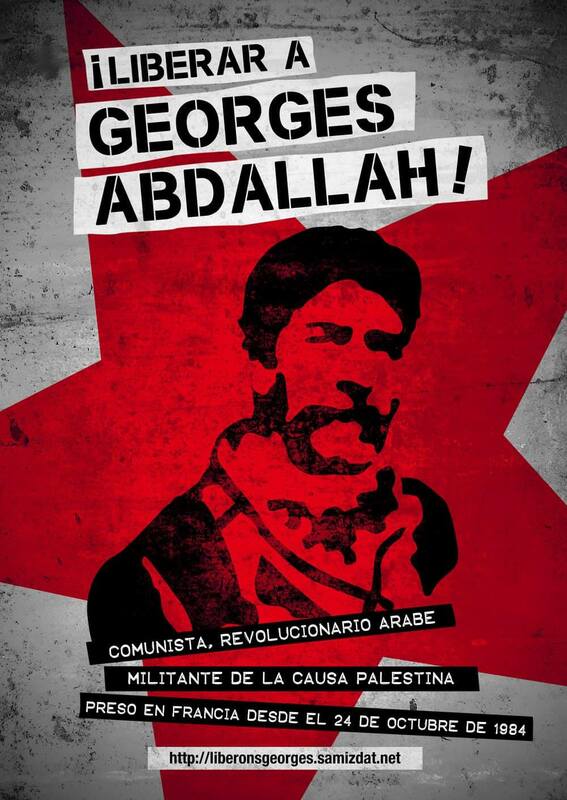 Organize an event or take a social media action by posting photos with signs calling for freedom for Georges Abdallah. 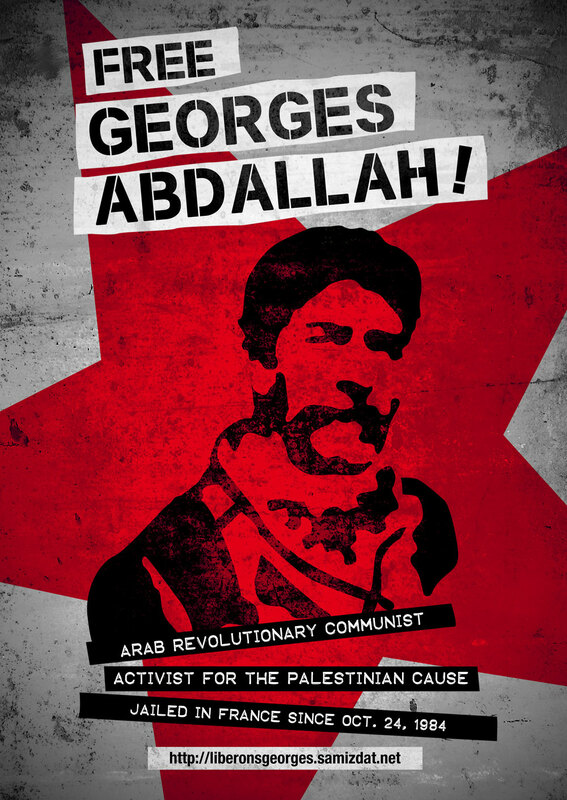 If you are organizing another event for Palestine or other social justice issues, take a group photo with our materials to free Georges Abdallah. In 1987, when Georges Abdallah was sentenced, he was expected to receive a lengthy sentence of ten yearsor less – as recommended by the prosecutor in his case. Instead, he received a life sentence, as argued by a private lawyer representing the U.S. government. Palestinian youth seized in new attack on Dheisheh refugee camp by so-called "Captain Nidal"